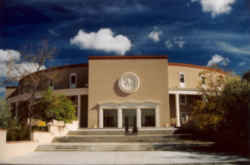 Take a peek at New Mexico history. Discover an overview of New Mexico's rich history, heritage, historic events, and culture. Less than two generations after Christopher Columbus set foot on the shores of an obscure Caribbean island on October 12, 1492, and claimed this New World for the Spanish kingdoms of Leon and Castille, Spanish conquistadores such as Hernán Cortés and Francisco Pizarro had conquered the Aztec Empire in Mexico and the Incas of Peru. 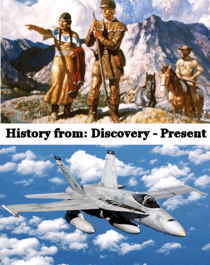 Subsequent explorers remained on the alert for other lands which might prove as wealthy as ones these men had conquered. It was this search for a "new" Mexico which ultimately led to the expedition which first brought the Spanish to New Mexico in 1540. Ironically, the first exploration of New Mexico may have come about from an ill-fated Spanish attempt to settle Florida in 1527. A series of storms and shipwrecks stranded four survivors from this expedition near present-day Galveston, Texas. This group, which included Alvar Nuñez Cabeza de Vaca and an African slave named Estevan (also known as Estevan the Moor and Estevanico), spent more than eight years wandering through southern Texas and northern Mexico. They were the first Europeans to explore, albeit unwittingly, this part of North America. In 1536, the ragged survivors finally emerged from the wilderness at Culiacan, on the west coast of Mexico. Cabeza de Vaca's report to the Spanish Viceroy, Antonio de Mendoza, included a brief mention of stories they had heard which told of large cities in the interior of the continent where valuable minerals were traded. This sparked a renewed interest in the Spanish quest to find the "new" Mexico which had so far eluded them. In 1539, Mendoza authorized Marcos de Niza, a Franciscan priest who had accompanied Pizarro to Peru, to conduct a preliminary exploration. Estevan went along as the expedition's guide. When the expedition approached what is now southern Arizona, Estevan and several companions went ahead to scout the country. The scouts reported Estevan had learned of a place called Cíbola, and had been told this Cíbola was but one of seven magnificent cities. However, the Friar soon encountered several of Estevan's companions, who reported that their colorful guide had been killed. The Cíbola where Estevan was killed was in reality the ancestral Zuñi pueblo of Hawikah, however the friar's report seemed to confirm the stories which Cabeza de Vaca had heard during his travels. In January of 1540, Vásquez de Coronado set out from Mexico in search of treasure, and convinced that the adobe pueblos were the legendary Seven Cities of Cibola, Coronado had orders to conquer the Indians and claim their riches. For the next two years, the expedition explored deep into the North American continent, but discovered only that the Seven Cities of Cibola were, after all, nothing but a myth. After Vásquez de Coronado was injured in a riding accident in the winter of 1542, the disheartened adventurers returned to Mexico. Failing to find the fabled gold, however, he and his men returned to New Spain without any newly won wealth. History has shown the expedition to have been a journey of epic proportions. In little more than two years, Vásquez de Coronado and his men explored much of the southwestern United States, ventured deep into the plains of Kansas, descended the walls of the Grand Canyon, and visited all the major Indian villages in the region. For nearly forty years New Mexico was forgotten. As the sixteenth century progressed, Spanish settlement advanced slowly, but steadily through northern Mexico. During this period, Franciscan missionaries learned that Indians of the region traded regularly with other peoples who lived further north. During the 1580's several expeditions entered New Mexico and explored much of same region traversed four decades earlier by Vásquez de Coronado. One of these, led by Fray Bernardo Beltrán and Antonio de Espejo in 1582, is credited with the first official use of the term, la Nueva Mejico, to describe the region we now call New Mexico. Don Juan de Oñate made the first successful exploration of Mexico del Norte's wilderness. In 1598 he marched up the Rio Grande claiming land for Spain, accompanied by troops, colonists and cattle arrived at Caypa, one of two Pueblo villages at the confluence of the Río Chama and the Río Grande, north of present-day Española. He soon moved across the river to Yungueingge (Tewa for mockingbird place), a now-ruined pueblo he renamed San Gabriel del Yunque, the first Spanish capital of New Mexico. The first church in North America was also constructed in 1598 at San Juan Pueblo, 30 miles north of Santa Fe. Within the first quarter of the 17th century, 50 churches had been built in New Mexico. Santa Fe was founded as the capital in 1609 by New Mexico's third governor, Don Pedro de Peralta. The fortified villa real (royal village) occupied the site of an early Tanoan Indian Pueblo and a more recent Spanish settlement. Spanish priests begin converting Indians, and settlers pouring into the remote colony. But some of the priests became overzealous, and the economic tribute system enslaved the Indians. By the middle of the 17th century, there was growing discontent among the Pueblo people. On Aug. 10, 1680, after years of careful planning, the tribes led by Taos Pueblo, revolted, killing many of the 3,500 settlers strung out from Santa Cruz de la Cañada (near Española) to Socorro and driving the rest south to El Paso del Norte (El Paso). By 1692, however, the Spanish had returned. New settlers led by Don Diego DeVargas, the newly appointed governor and captain-general of New Mexico, began to reconquer the northern pueblos, a task that took four years. Throughout the next century the Spanish were more tolerant of the Pueblo culture. Because of the area's isolation and neglect from both Spain and Mexico, the Spanish colonists persevered with limited resources and vital help from their Pueblo neighbors. The two cultures adopted traits from each other and the result is a distinct cultural commingling that succinctly identifies much of New Mexico's charm today. New Mexico remained under Spanish rule until 1821 when Mexico won its independence from Spain. Running from Missouri to Santa Fe, the trail opened trade with the US and brought new lifestyles, money and settlers to New Mexico. In 1824, New Mexico briefly became a Mexican territory, but in 1846 US Gen. Stephen Watts Kearny's troops followed Anglo merchants down the Santa Fe Trail to occupy New Mexico, which became an American territory. An 1847 revolt by Mexican loyalists precipitated battles at Santa Cruz and massacres at Mora and Taos, but eventually armed resistance ceased. The war with Mexico ended when the Treaty of Guadalupe Hidalgo was signed in 1848. Two years later, on September 9, 1850, the United States Congress passed an Organic Act which created the Territory of New Mexico and authorized the establishment of a new civil government. During the US Civil War, New Mexico Volunteers were among the troops proving their Union loyalties by helping cut the supply lines of invading Confederates at Apache Pass, near today's Glorieta. The US army forced the Navajo and Apache Indians onto a reservation on the Pecos River in 1886, and in the late 1880s, the railroads steamed in, forever changing New Mexico. Commerce improved, but under the imported US legal system, dishonest Anglo lawyers defrauded many natives of land they had held for centuries. And, cattle barons such as John Chisum started rounding up longhorns along the southeastern plains, often battling native landholders. Chisum also was involved in the bloody Lincoln County Wars, a conflict between two mercantile houses that involved such notables as Pat Garrett, Billy the Kid, and Gov. Lew Wallace, who wrote the novel Ben Hur. Despite injustices, New Mexicans remained patriotically American. In 1898, Teddy Roosevelt recruited his "Rough Riders" from New Mexico, many from Las Vegas. Although New Mexico was colonized nearly 25 years before the Pilgrims' arrival at Plymouth Rock, it did not achieve statehood until Jan. 6, 1912, when it was admitted to the Union as the 47th state. The Great Depression, 1930-43, almost eliminated the isolated villages--heart of the Hispano homeland. But New Deal programs helped villagers survive. During World War II, two New Mexico regiments endured the Bataan Death March in the Philippines. Navajo and other Indian "code talkers" used their native languages to help confuse the Japanese. Things heated up again in the politically tumultuous 1960s, when activists led by Reies Lopez Tijerina attempted to reclaim Spanish land grants. After several confrontations, including an armed raid on the Tierra Amarilla courthouse, the movement quieted. New Mexico has now become a research center and testing ground for government studies. In Los Alamos, they are studying ways to use nuclear energy. In Albuquerque, they are developing uses for military inventions during times of peace. In White Sands, they test weapons. In 1994, the North American Free Trade Agreement (NAFTA) increased trade with Mexico. In 1998, New Mexico reached a milestone in its long and colorful history. It is the year the state observed the Cuatro Centennial, or 400th anniversary of the founding of the Spanish colony at the Tewa village of Ohkay in 1598.